This is the Data Selfie origins story so to speak. 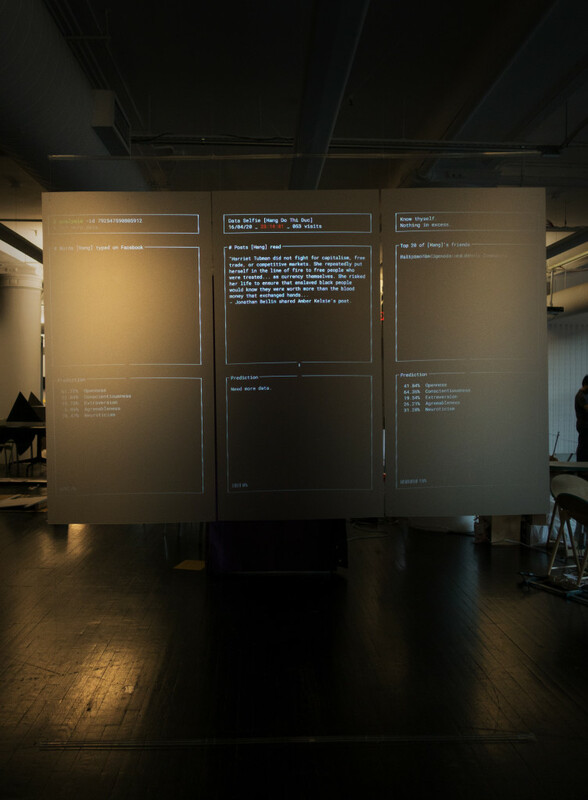 Head over to dataselfie.it for the most recent (2017) version and form of this that was featured on among others FastCo Design, Vice (France), Süddeutsche Zeitung, The Next Web and Product Hunt, and exhibited in 2017 at Neotopia: Data and Humanity at Art Center Nabi, Seoul, South Korea. Data Selfie is a Chrome browser extension that tracks people while they interact – click, type, scroll, dwell – with content on Facebook and that predicts various personality traits based on that data. I used it for two weeks (April 18 – May 1, 2016) and transformed the results into a time-based data visualization that is presented as a projection on translucent material to represent on the one hand the ‘glassy’ consumer and the transparent person, but also on the other hand the lack of information transparency. Internet users deliberately create different identities on the different platforms they use. They control how they want to be seen. Data Selfie addresses the curiosity about how the data profiles they make compare to the ones made about them by machines at Facebook, Google and Co. – the only profiles they never get to see, but unconsciously create. This project aims to provide a personal and differentiated perspective on data mining, predictive analytics and our online data identity – including inferred information from our consumption. In our data society algorithms are omnipresent and seemingly omniscient and omnipotent. We can hope that Big Data will solve all problems of humanity or fear a future of total control and surveillance, without freedom. One thing is certain, Big Data algorithms increasingly define our lives. Therefore, it is important – especially for those who are indifferent to this issue – to be aware of the power and influence of our data on ourselves. Can our data selves help us understand ourselves?! Can it really? I am currently working full time on the tool and the data analysis. More information on my progress on my thesis project in MFA Design + Technology, Parsons School of Design can be found on my blog. April 2016: My thesis vision has inspired a related project that has also been part of the NYC Media Lab Combine program with $25 000 of funding. Here is the journey that myself and my collaborator Regina Flores Mir have gone through. May 2016: Here is a little (muted) preview of the data art installation I created for my own data. To only see the raw visualization without the installation, click here.